Please note that while our final release will include a 64bit App Pack disc, our testing ISO images will not include one until we reach a release candidate state. Existing Bodhi users should note that because these discs signify a new major release we will not be supporting in place upgrades from previous Bodhi versions. 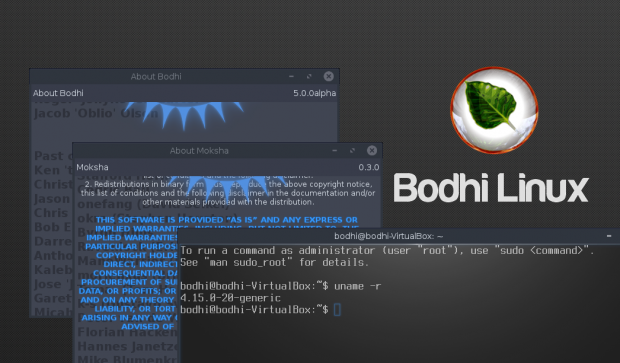 That being said this is your reminder that Bodhi’s 4.5.0 release will get support until April 2021, so there is no rush to upgrade. Please note the focus of these ISO images was simply getting Moksha up and running on the Ubuntu 18.04. I have yet to clean out the ISO images of excess clutter or ensure that everything we expect to deliver a full Bodhi experience is present. We hope these discs will help serve as a testing ground for some of the changes we have been back porting for Moksha before we tag a 0.3.0 release of the desktop. Because we are a project driven 100% by volunteers, there are no strict time lines for how the release cycle for 5.0.0 will fully pan out. Keep your eye on this page for updates as we get time to work on things. Also keep in mind that any future releases towards 5.0.0 you will be able to upgrade to via your package manager so installing early is fine so long as you don’t mind the occasional issue here and there. Speaking of – if you do give the 5.0.0 alpha a try and hit any issues – be sure to drop a thread in our shiny new 5.0.0 forum section.